Shades of red and pink are romance colors; they speak of passion, love, and commitment. We have put together a bouquet that will spark this and so much more in your relationship. 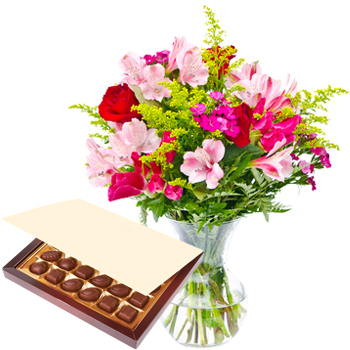 Your recipient will receive a bouquet of classic red Roses, pink Alstroemeria, and other mixed flowers and to make her day even sweeter - we've added a box of fine Chocolates (150 g). Say I Love You, celebrate your Anniversary, or Valentine's Day. Please note: The box of chocolate and exact flowers may vary slightly depending on delivery location. "I am so impressed with the service. Was punctual and they did everything they could to make it on time. They even went out of their way when the phone number was not working to try other means to contact the recipient. Will always use this company for my international and local gifts. I strongly recommend this company to everyone I know that is looking for gift delivery or any other service they provide."